Bonnie Doon Free Library. The Mechanics' Institute movement began in British urban industrial centres in the early 1800s. A "mechanic" was a person applying skills and technology. During the 19th century, most towns in Victoria established a Mechanics' Institute or Athenaeum with a library and meeting hall. Common objects were the "spread of useful knowledge" and provision for "rational recreation" in the community. Bonnie Doon Free Library was built in 1930 in the original township of Bonnie Doon. It replaced a Mechanics’ Institute that had operated from 1897 to 1929. The library and public meeting place was relocated to Bon Crescent when the expansion of Lake Eildon Submerged the township in 1955. In 2011 the building was moved to Arnot Street where it has been renovated and restored to its former glory. This plaque, No. 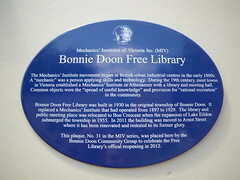 31 in the MIV series, was placed here by the Bonnie Doon Community Group to celebrate the Free Library’s official reopening in 2012.